The Pittsburgh Steelers offense had no issues dealing with the Indianapolis Colts in Week 13 of the 2015 NFL regular season. A large part of that success was another record performance by quarterback Ben Roethlisberger. After a slow opening quarter, Roethlisberger helped jump start the offense by taking control in the second quarter with a 10-pay, 80-yard drive that ended with a seven-yard toss to wideout Antonio Brown and a two-point conversion by fullback Roosevelt Nix. The very next offensive series, Roethlisberger used another 80-yard drive to push the Steelers down the field in six plays topped off with a pass to Markus Wheaton for score with just ten seconds left until halftime. The Steelers led 21-10 and Roethlisberger had 219 passing yards at that time, joining former San Diego Chargers quarterback and Hall of Famer Dan Fouts as the only two quarterbacks in league history to reach a minimum of 200 yards passing in by the halftime mark in four consecutive games (Fouts, 1981). Roethlisberger finished the game with 24 completions to seven different receivers on 39 attempts for a total of 364 passing yards, four touchdowns and no interceptions. His final quarterback rating: 126.4. Historically, the Steelers are 60-7 in games when Roethlisberger finishes with a QB rating of 100.o or better as the starter. 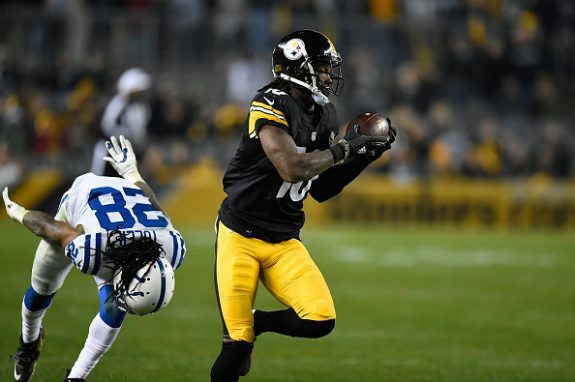 Martavis Bryant – Finished the game with 114 yards on four receptions, a nice 28.5 yards per-catch. Caught a 68-yard pass that he carried into the end zone. Antonio Brown – Recorded 118 yards on eight receptions, two catches ending up in the end zone. Finished off the Colts with a 71-yard punt return for six points (totaled three touchdowns on the game). James Harrison – Had three sacks on the game and a forced fumble. Jarvis Jones – Caught an important interception of Matt Hasselbeck shortly after his teammate, Jacoby Jones, fumbled the opening kickoff (Indianapolis recovered). Be the first to comment on "Steelers Gab Player of Week 13: Ben Roethlisberger"